Rose Yunnan Black Tea is made from fine black tea mixed with rose buds and petals. The black tea comes from the cloud-veiled mountains of the Yunnan province. Yunnan Black was first produced over 1500 years ago, making it one of the oldest teas. 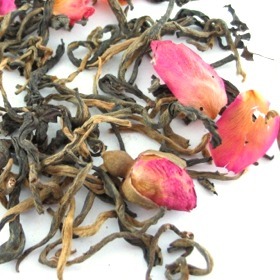 This is a superior Rose Yunnan Black Tea with sweet rose fragrance for all occasions. Rose Yunnan Black Tea is suitable as a gift to your loved one. Sweet malt taste and a refreshing floral aroma. Beautiful small tightly rolled khaki-colored tea leaves with rose buds and petals. Reddish brown liquid. Fantastic aroma and good for multiple infusions.